I love trying new recipes. 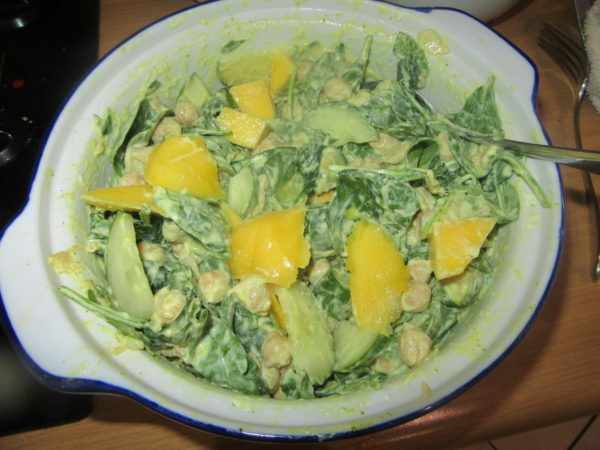 This time the Curried Chickpea salad in Pick ‘n Pay’s Fresh Living Jan/Feb 17 magazine appealed. However being me I made a few changes. 3 Tbs curry powder seemed a huge amount, 1 tsp of mild and spicy curry powder was absolutely adequate. I didn’t like the idea of raw baby marrows so cooked them first. I also added cucumber, mango and a splash of lemon juice. Despite the changes made I’m grateful for a great recipe as a starting point.